EDMOND – It will go down as a 4-yard touchdown pass, but Grant Decker needed a longer pass to make the play. On third-and-goal from the 4, Decker mishandled the snap, and the ball bounced backward on the turf toward the 20-yard line. 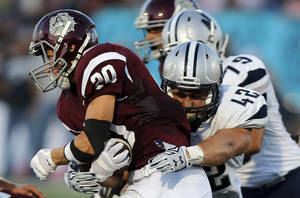 Decker recovered, then zipped the ball to teammate Nick Hale beyond the Edmond North defense. Touchdown, Edmond Memorial for a stunning halftime lead. The Bulldogs went on top for good 19 seconds before halftime on the way to a 27-14 Edlam win Friday night at Wantland Stadium. Decker, a junior quarterback, boosted Memorial (1-1) with 127 rushing yards, two touchdown runs, and 115 yards and a touchdown through the air. "There were some problems right there," Decker said about his scoring pass to Hale. "We all got messed up, it was really wild. There was a weird snap just to the left. We were really off. My wide receivers got open, scrambled well and got a nice block up front. I was really proud of them." Memorial added Braxton Pickard's 28-yard field goal on its first drive of the second half. On its next chance with the ball, Memorial drove 66 yards in nine plays toward Decker's 4-yard scoring scramble. Decker scooted for the 2-point conversion and a 27-14 lead with 4:13 left in the third. In the fourth quarter, North (0-2) tried to claw its way back into the game by driving to the Memorial 5-yard line. Memorial stopped Noah Tews short of the goal line on a fourth-down run with nine minutes to go in the game. Antonio Williams gave the Huskies another chance by recovering a Memorial fumble at the Bulldog 23. On fourth-and-goal from the 7, Aaron Ward broke up Tews' pass into the end zone. Memorial ran the clock out afterward. "They really helped us," Decker said of his team's defensive unit. "I'm just really proud of the defense. They made some good stops." Early in the second quarter, Memorial capitalized on an errant snap on a North punt for a safety and a 9-7 edge. The Huskies responded on their next drive by taking the lead on Darius McGlothin's 3-yard touchdown rumble. North held a 14-9 lead with 6:15 left in the second. Alex Smith, who scored North's first TD, covered 44 yards of the 61-yard march on one run. Memorial senior Tate Troxell added 49 rushing yards and three catches for 165 yards. Troxell's 62-yard catch-and-run off Jonah Weltzheimer's throw set up Memorial at the 9-yard line on the Bulldogs' go-ahead drive. Senior Mitchell Perkinson provided North with nine grabs for 107 yards.